What’s better than knitting chic accessories in a squishy yarn? Knitting those projects quickly! 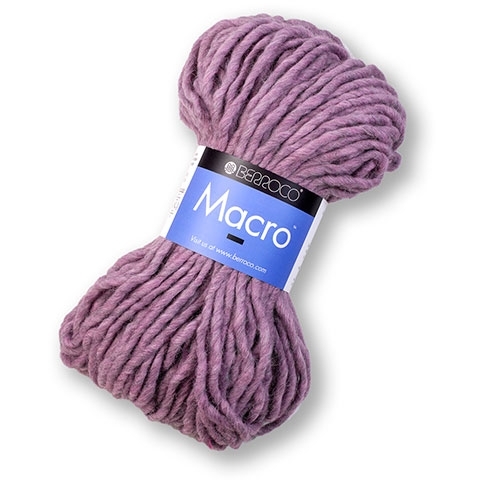 Berroco Macro™ is perfect for fast, satisfying knits. Let’s take a look at this new yarn! Berroco Macro is a blend of 50% wool, 40% acrylic, and 10% alpaca. It’s a singles yarn, meaning that it’s only very loosely twisted and not plied at all. Each hank is a whopping 250 grams, with 112 yards (102 meters)—knit on big needles, that’s actually quite a bit of real estate out of one hank of yarn. The recommended needle size for Macro is a US size 17. I knit my swatch on a US size 15 needle, as my gauge is usually a bit looser. This swatch took me about 10 minutes to knit, tops. The fabric is soft to the touch and would yield a very cozy finished piece. The acrylic content helps to hold the yarn together while keeping it soft—typically, plies and twist give yarn its strength, so a single-spun yarn needs a little extra stability. A plant-based fiber would also lend stability but could sacrifice some of the softness, depending on the fiber. As you can see, Macro takes up a lot of space! I got about 8 stitches into 5 inches in this swatch—other times I’ve used this yarn, I got an average gauge of 2 stitches to the inch. This means you get a lot of oomph without a lot of stitches. And oomph is what we deliver in Booklet 378 Berroco Macro. The six accessories in this collection are quick to knit and have a very urban-style appeal, while remaining supremely wearable in any location. Dai is a two-color scarf knit lengthwise; Macro comes in seventeen awesome colors, so the color combinations for this scarf are endless. Keiko is another two-color scarf, but is knit widthwise, and features varying-width stripes of each color. Hana is a triangular scarf worked end-to-end with two hanks of Macro. Rini is a capelet made with two hanks of Macro, with an exaggerated rib stitch pattern. Miyo is a hat that’s knit in a simple rib from one hank of Macro. And Ima uses another rib-stitch pattern to work an easy cowl that’s knit in the round. This week’s KnitBits newsletter included a link to a free knitting pattern in Berroco Macro—be sure to read the newsletter and get your copy of Zoya! Rini is my favorite … I’m not a fan of thick yarns, but that capelet looks cozy.